Many people think Chiropractors are simply back doctors that only deal with neck and back pain. This is a huge misconception. A doctor of Chiropractic specializes in relieving the pressure of a hard bone on a soft delicate nerve through a series of gentle adjustments. When a nerve is being compressed by a bone or muscle the proper amount of information traveling along that nerve is compromised. In fact, the weight of a dime on a soft nerve is enough pressure to decrease nerve flow up to 40% in some patients. What does this mean? Well, imagine that the nerve flow to your heart was decreased by 40%. That would mean your heart is only receiving 60% of the neurological impulses it needs to sustain life. How? Every cell, tissue, muscle and organ in your body is powered by the Nervous System. Biological messages from the brain are sent throughout the body via nerve pathways, allowing it to function. In fact, there isn’t one solitary molecule in your body that escapes the dominance of the Nervous System. These messages run from the brain, down the spinal cord, along spinal nerves which exit the spinal column through small holes, and finally terminate at various places in the body. When two bones of the spinal column misalign upon each other the nerve running between them is “pinched” and nerve flow is interrupted. This is known as a Vertebral Subluxation. Keeping your body subluxation FREE you are allowing every cell, tissue, muscle and organ the ability to function at its optimum level of performance. 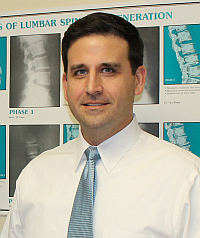 It is important to have your spine examined by a Doctor of Chiropractic at least twice per year. Chiropractic is a branch of the healing arts which is based upon the understanding that good health depends, in part, upon a normally functioning nervous system. "Chiropractic" comes from the Greek word Chiropraktikos, meaning "effective treatment by hand." A Chiropractors main objective is detecting and correcting musculoskeletal areas of the body which are functioning improperly. Corrective procedures are performed through a series of gentle adjustments and may also include adjunctive physiotherapeutics such as electric muscle stimulation, ultrasound...etc . The health conditions which Doctors of Chiropractic address are as varied and as vast as the nervous system itself. Every new patient will undergo a comprehensive physical examination consisting of orthopedic and nuerological testing to properly diagnose a patient's condition and arrive at an effective course of treatment. Our Doctors use the same time-honored methods of consultation, case history, physical examination and x-ray examination as any other doctor. In addition, we provide a careful Chiropractic structural examination, paying particular attention to the spine. Stiso Chiropractic also place an emphasis on proper nutrition, physical exercise programs, and lifestyle modifications for promoting positive overall health. Although, as Chiropractors, we make no use of drugs or surgery, the Dr. Stiso actively refers patients for medical care when so indicated by our clinical findings. In fact, Chiropractors, MDs, physical therapists and other health care professionals now work as partners in occupational health, sports medicine, and a wide variety of other rehabilitation practices. In addition, most of our patients are referred to us by a local primary care physician. Today, research in Chiropractic has grown by leaps and bounds thanks to the assistance of a number of organizations. The scope of chiropractic research parallels that of medical research, with active research involvement in such areas as basic science, health services, education, and clinical research. For additional information, call Dr. Stiso at (732)528-7746.